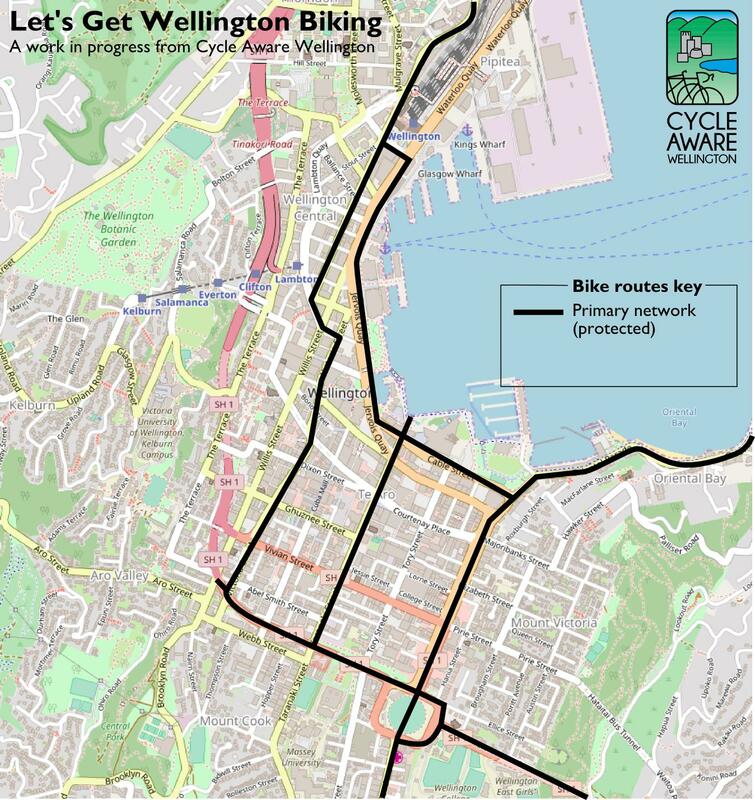 The Let’s Get Wellington Moving project has four scenarios out for consultation. The outcome of the project will shape Wellington’s transport network. Have your say before the 15 December deadline! Yes, that’s 15 December, pretty soon huh. Get to it! Here’s our take on what needs to be in the mix for a city that moves people around effectively and supports comfortable and convenient biking to and through the CBD. FIT’s ‘Scenario A+’ is a great start: LGWM’s scenario A plus light rail to link major destinations AND introduce congestion charging. Add in a downtown biking network of protected cycleways. Back it up with links on quieter traffic-calmed streets and safe, quick ways to cross SH1 and other arterial roads. Make a bigger deal about how biking can contribute to transport and placemaking. We were disappointed to see the LGWM scenarios are ‘more or less change’ options instead of a range of different approaches and priorities. We want to see a higher priority for PT and active transport than for driving. We shouldn’t have to suffer Moar Roadz to earn decent biking, and indeed any improvements to arterial roads will just feed more traffic into the CBD’s other streets, making biking worse and offsetting the ‘biking bonus’ of the expensive roading schemes. BUT! LGWM can mix and match aspects of the scenarios. FIT and Congestion Free Wellington have proposed a ‘Scenario A+’: LGWM’s scenario A plus light rail to link major destinations AND introduce congestion charging. Good stuff: high-quality public transport through the CBD makes a good carrot. To build ridership, it must have full priority over other traffic. Congestion charging is the stick to match. Rather than loosening its belt, Wellington can give road priority to tradies and others who need to drive through the CBD at busy times. Just a few percent reduction in driving would make every day a ‘school holiday dream commute’. feel more efficient than main motor traffic routes (less waiting) so you get the benefits of concentrating bike traffic where it’s best catered for. Some CBD streets are narrow; others nice and wide. Narrow streets aren’t necessarily a problem for biking when you have a good plan of which streets are prioritised for which modes of transport. A proper network approach should decide which CBD streets to prioritise for biking. We’ve set out some ideas for a primary and secondary biking network for the CBD. a connection from the Mt Vic Tunnel to Cobham Drive. links to suburbs: Brooklyn, Aro Valley (inc access to Polhill mtb tracks). The focus here is on the CBD – other links like Berhampore-Newtown-CBD will play an important role too. And other transport decisions could create their own opportunities, opening up new corridors or reducing the volume of traffic on busy roads to open up biking possibilities. Managing traffic speeds and volumes on specific other streets would provide quieter biking links to complement the main biking grid. Scenario A mentions managing speeds, but traffic volumes needs to be low as well to share comfortably – probably too low for most CBD streets to work well as key routes. Unless… you remove through-traffic from some side roads while allowing access. For example, during the construction of Pukeahu war memorial, upper Tory Street was a quiet bike-friendly street. Now it’s back to a rat run. Do we really need through-traffic driving through the park? Provide safe, quick ways to cross SH1 and other arterial roads. Most walking or biking trips into or out of the CBD involve a long wait to cross SH1 or the quays’ arterial roads (remember how the urban motorway was supposed to free up traffic there?). For a short trip, a couple of peak time waits can double your journey time. Long waits sever communities, and encourage risky crossing by people who are in a hurry. Walk/bike underpasses would speed up crossings and extend connections beyond the CBD to connect to the main suburban routes. Compared to road underpasses, walk/bike underpasses are smaller and much cheaper. And they are lower effort to use and less exposed than bridges. Candidate spots: Cobham Drive, Wellington Road, Vivian Street, and Karo Drive at Taranaki, Victoria and Willis. In other places, crossing-signal timing changes beyond today’s motor-prioritising guidelines could reduce the worst-case waiting times. To recognise and measure the benefits of mode shift to biking and walking, they should be quantified in scenario comparisons – not just how many people are biking as a ‘nice thing’, but the transport and health contributions that makes too. We’d also love to see more in the scenarios about how different the CBD will feel and how much nicer a place it could be to, well, be in. 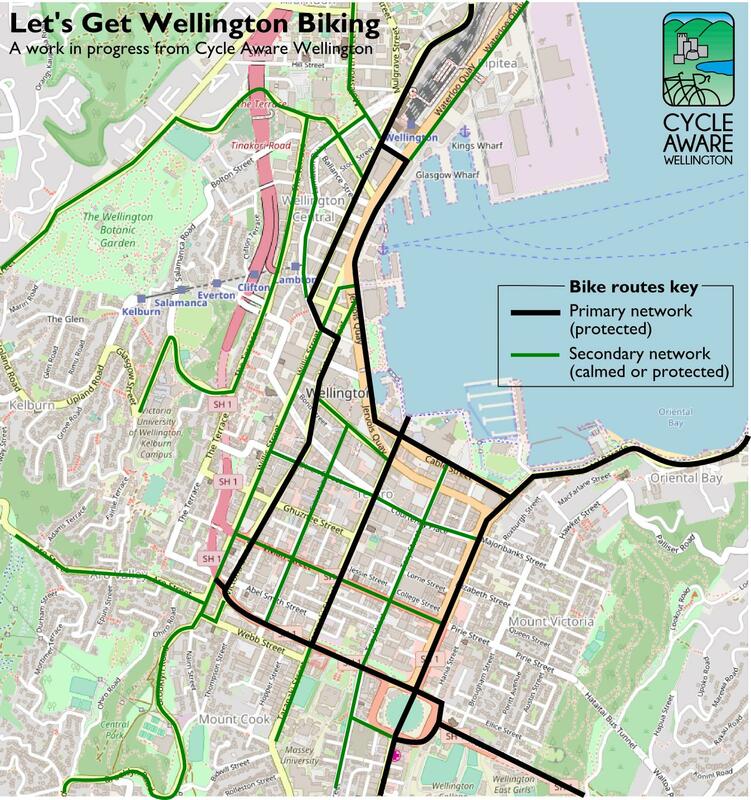 More commitment and detail on the biking and walking, and models that better recognise induced demand, would help make the case for a thriving Wellington that isn’t choked in traffic.